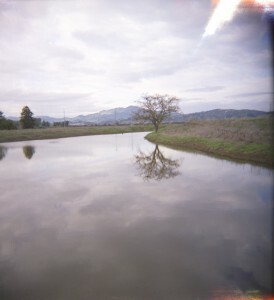 Hi all, I wanted to add another entry and post a Holga image I have taken this semester and did not use in the Midterm for the Pinhole And Plastic Camera class because it didn’t quite fit into the series, but is one of my most favorite images. So I will post it by it’s self just because it needs to be in here to be seen. It’s right near my home and is often overlooked by everyone and it’s a little gem of a place, and I have photographed it before with different cameras, and intend to do a study of it in all weather, times of day, and all seasons. That will be a fun project. For now here it is shot with a little Holga. This entry was posted on Friday, May 14th, 2010 at 1:49 pm and is filed under Plastic Cameras and Pinhole Cameras. You can follow any responses to this entry through the RSS 2.0 feed. You can skip to the end and leave a response. Pinging is currently not allowed.